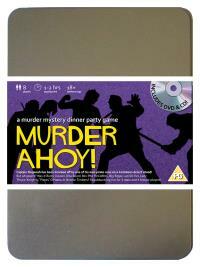 You've been invited to play the role of JILLY ROGERS in Murder Ahoy. You are invited to a swashbuckling murder mystery set in the tropical waters of the Caribbean! Captain Mugwash and his pirate crew are shipwrecked on a desert island where they find a buried treasure chest. But during a drunken celebration on the beach the Captain is discovered slumped over the chest, murdered! Please join us to find out who buried the ol’ Sea Monkey! Captain’s Daughter (you can hoist her up the flagpole!) Costume suggestion : As the only female pirate on the crew, your britches and shirt are a flattering green pastel shade, and your boots are long (sometimes thigh-high!) with lace ties. You carry your cutlass wherever you go, and your bandana and eye patch are uniquely white. I’m Captain Mugwash’s daughter and I’ve been travelling the world on the high seas for as long as I can remember. I was brought up to be as good a pirate as any of the crew of the Dirty Monkey and nothing makes me happier than pillagin’ and plunderin’. Sadly, my one true love, Gravy Bones, was killed in the shipwreck and I don’t know how I’m ever going to get over it!